Coffee should ideally be stored in a cool, dry and dark place. The WMF coffee canisters ensure that your coffee is not affected by light, odours or humidity. Coffee always tastes best when it is freshly ground just before use. However, if you don't yet have a fully automatic coffee machine and prefer to make your coffee in a normal coffee machine, you should at least ensure that the coffee powder does not lose its flavour once you have opened the bag. A good coffee canister can ensure that the coffee retains its original aroma reliably for up to eight weeks. It is essential to store coffee correctly to ensure that it neither loses its own aroma nor takes on other scents. As the oils in the coffee beans oxidise at room temperature, coffee should always be stored below this temperature threshold. This prevents the coffee from quickly turning rancid, which would give it an unpleasant taste. However, the fridge is not a good place to store your coffee either because of the other odours that are predominant there. Coffee is ideally stored in a cool, dark place. If the coffee canister also enables you to completely eliminate oxygen and light, then there's nothing stopping you from enjoying your coffee over the long term. Theoretically, any container would do for storing your coffee. Unfortunately, plastic containers often have an odour of their own, which the coffee is only too happy to absorb. The WMF coffee canisters are therefore made of matt Cromargan® stainless steel, which is completely odourless. As a result, the models are also always dishwasher safe. Of course, the ideal coffee canister also has an airtight lid to keep out oxygen, odours and humidity. As WMF is always keen to offer products with a little extra in terms of function, the coffee canisters always come with a measure, which allows you to spoon the exact quantity from the coffee canister for one cup of coffee.  Order your top quality WMF coffee canister now. It has never been easier to preserve the perfect, full-bodied flavour of coffee. Skimping on quality was yesterday – today belongs to WMF coffee canisters!